1. From Ghost Browser, click the three-dot menu in the upper right corner of the browser and select Manage Shortcuts. 2. Click inside the text box for the shortcut you want to edit and enter new keystrokes. Example: To enter “ Ctrl+M” as a shortcut, click in the text box for the shortcut, press and hold the CTRL key, and then press the M key. 3. Select In Ghost or Global from the menu to the right of the shortcut. In Ghost: The shortcut only works if Ghost Browser is active. Global: The shortcut works no matter what application is active. If the shortcut is shared with another application, the active application’s shortcut takes precedence. 4. Click OK to save your shortcut values. To delete any shortcut value, click the X to the right of the value. 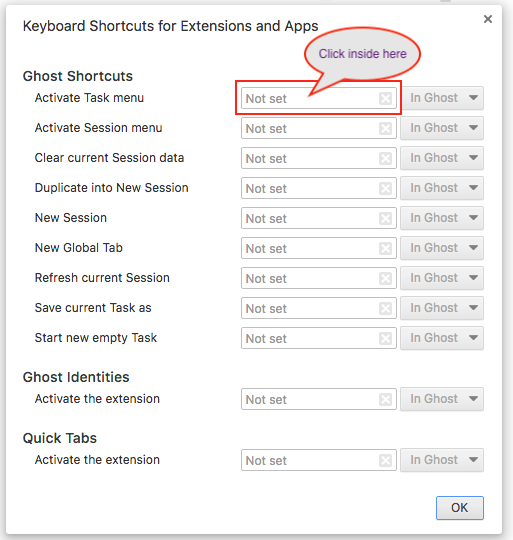 Keyboard shortcuts let you quickly access some of Ghost Browser’s functions and your installed extensions so you can boost your productivity. These shortcuts are customizable. The following table displays keyboard shortcuts in Ghost Browser and example values.